Garage yogis! Greetings from Mysore, India, the birthplace of Ashtanga Yoga. It is here where I have the amazing opportunity to study at length with Sharath Ragaswamy, the grandson of the founder of Ashtanga Yoga, Guruji Sri K. Pattabhi Jois. Instead of only boring you with details of the physical practice I will provide you with some Garagi philosophy and practice inspiration for the next 3 months. So get excited. On Tuesday Laci and I visited the great bull Nandi on Chamundi Hill in Mysore. 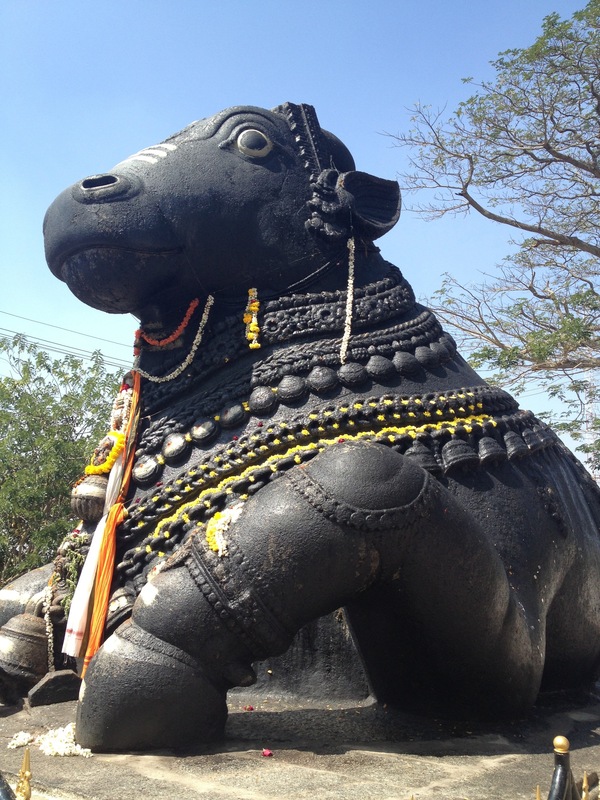 Nandi is the revered ride or sahana of Shiva, the destroyer. According to the Natha tradition, (remember the origins of Hatha yoga are attributed with the Natha sect) Nandi is the most devout discipline of Shiva and is considered a primal guru. From the yogic perspective, Nandi is the mind dedicated to Shiva. He is the inner guru that exists within all of us and ultimately, Atman, the individual soul. Nandi is also the chief guru of the 18 siddhis or masters including Patanjali, the author of the Yoga Sutras. Nandi represents brute power and unbridled sexuality in men. Shiva rides the bull to prove that he has the power to control these forces. Nandi is the gatekeeper to Shiva and Parvati’s abode. There is always a bull in front of sanctums for Shiva guarding the sacred place. Thus cows in India are tremendously sacred. They roam freely through the streets (often stopping traffic) and are well fed, friendly, adorned with flowers and incredibly calm. In Hinduism curd, milk, urine, dung and butter from the cow is believed to cleanse the body and purify the soul. So muster up your brute, bull-like strength in my absence by practicing hovering bakasana. Use your strap, the wall, a block; but most importantly use your Garagi sthira(strength), grace (bhaga) and determination.